It was a shock when Colombians said no to a peace agreement to end fifty years of conflict. Does that mean a return to violence? 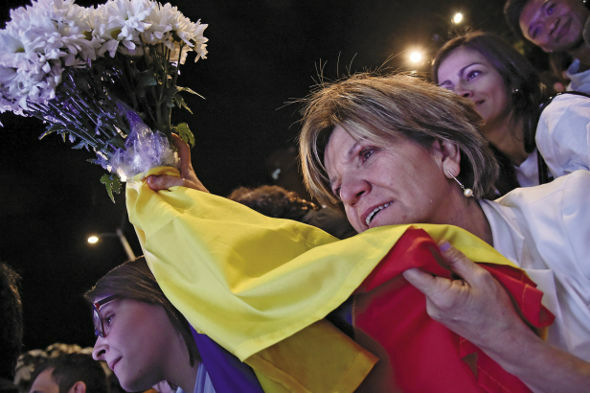 Or can peace come?Tatiana Garavito writes about the situation in Colombia. The leader of the peace talks was clear. If voters did not vote for the peace agreement between the Revolutionary Armed Forces of Colombia (FARC) and the government, then the country would be in a terrible situation. There was no other possible plan. And on 2 October it seemed that the terrible situation was there after the ‘no’ vote won by 50.2 to 49.8 per cent. This was not what the polls thought. Ex-president Álvaro Uribe led the no campaign. They persuaded enough Colombians that it was going to be too easy for the rebels, and voting for the peace agreement was unjust. It was a surprise that the strongest ‘yes’ vote was in areas with the most victims of violence. The strongest ‘no’ vote was in Uribe’s rural areas.The result was a terrible shock for the people who worked for peace and voted for the peace agreement. After the referendum, FARC leader Rodrigo Londoño (‘Timochenko’) said that peace was ‘a constitutional right’ and that the rebels would follow the peace agreement. 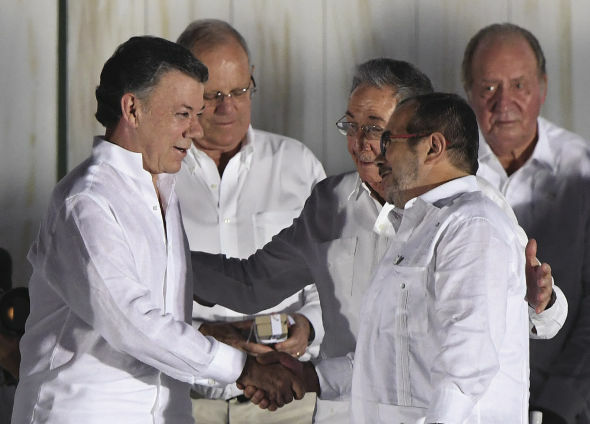 Juan Manuel Santos said that both sides would follow the ceasefire and work together. The ceasefire was extended until the end of October. Meetings across the country asked for the peace process to continue. For the first time in six years, President Santos met his big rival, Uribe. They agreed the peace plan in Havana and prepared for more talks there. The international community offered help and support. Across Colombia groups of women, and indigenous and farmer communities, who worked hard for peace before joined the peace process again. We find democracy not only at the polls. We need to take it to the streets to change the country and to continue to find peace. Return to violence is a terrible idea. Colombians know very well what it means. For 52 years, the longest armed conflict in the west ruined the lives of more than eight million people. That is 15 per cent of the country’s people. The numbers are like in Afghanistan but there is much less international attention for Colombia’s conflict. Figures show 280,619 people were killed and more than seven million had to move to other parts of the country. There were over 29,000 kidnappings, 45,000 forced disappearances, 11,000 victims of landmines, 10,000 victims of torture, and 13,000 victims of sexual violence. Women were affected most. Claudia Mejia Duque is from the organization Sisma Mujer. She said, ‘Women and girls are weapons of war and the biggest affected group in society.’ Then, in the summer of 2016, after almost four years of talks, FARC and the Colombian government made a peace agreement. Colombia’s crisis begins with colonialism, which continues day. We can see it in the political power of the rich, in the poverty and corruption, and, of course, in state violence. FARC started in the early 1960s. Armed peasant movements fought against land grabs and joined first with the Liberal Party and then the Communist Party of Colombia. In 1964 this became FARC, a guerrilla army against the government. Then in 1984 after peace talks with the government there was a ceasefire and a new leftwing political party, the Patriotic Union. But hopes for peace were lost when paramilitary organizations linked to the rightwing AUC, and supported by state security killed over 3,000 Patriotic Union members. In 1990, the ceasefire ended. After nine years there were new talks. It is easy to understand that there was not much trust between the parties. Also, the talks wanted too much - to change Colombia with a list of over 100 points. In 2002 talks ended again. So many failed talks made the way for Uribe. He was a very rightwing politician and the people elected him president when he said he wanted to end FARC. With Uribe as president and 500,000 more police and army, there was more conflict. The US gave help with Plan Colombia, part of the US ‘war on drugs’. At one time, FARC had 20,000 fighters. Uribe’s father was killed in a failed FARC kidnapping. He could not end FARC as he wanted. And there were more human rights violations. 300.000 people had to move to other parts of the country. When Uribe failed, it brought more support for new peace talks. Juan Manuel Santos of the National Union Party was elected president in 2010. The National Union Party was a group of rightwing political parties. Then there was more public support for peace talks. This was because of the Green Party political opponent, Antanas Mock. Across Latin America, leftwing parties had been winning power and FARC had been losing power. The rebels understood that the state did not want a military victory because it could only be a part victory. There was also a possibility that FARC would not have the political power to have peace talks. All of this meant people were ready for new talks. They began in 2012 in Cuba. FARC and the government talked before about a long list of points without other members of society and without listening to the conflict’s victims. This time they decided to include the victims. In 2014, both sides agreed on the Declaration of Principles for victims’ rights to truth, justice, reparations, and safety. They invited sixty people to tell their stories. This led to a special tribunal for peace and a court of justice to help with the human rights violations. And to a way to find out about the 45,000 people who disappeared. Another important point was land reform. Colombia is one of the few countries in Latin America never to have land reform – this was one of the causes of the conflict. Land reform became the first important policy that both sides agreed on, with peasant communities and large businesses working together. A new area is gender. After pressure from women’s organizations, both parties agreed in 2014 to a new gender sub-commission. The sub-commission was soon to have the job of looking after the gender issues of the conflict, to protect lesbian, gay, bisexual, transsexual and/or intersex rights. Women’s groups across Colombia explained the effect of patriarchy on the conflict and its causes. Colombian women have been active outside the country’s borders too, with the Truth and Memory Commission of Women in the Diaspora in 2015. Another organisation is the National Commission of Indigenous Women, which works for indigenous culture and territories, and supports programmes for social justice and human rights. Jineth Bedoya is a journalist, human rights defender, and survivor of sexual violence. Jineth says that there are problems in the future but we must face them if we want peace one day. To go forward we must understand where we have come from. It is very important that everyone in the peace process works to find the reasons for the conflict and does not blame those who started the conflict. We need to try to understand them. Peace is possible when both sides understand that everyone in the conflict is human. But we should not forget the crimes of the past; we must have justice. When FARC leader Timochenko said sorry to all the victims of the conflict, there were cheers and applause. 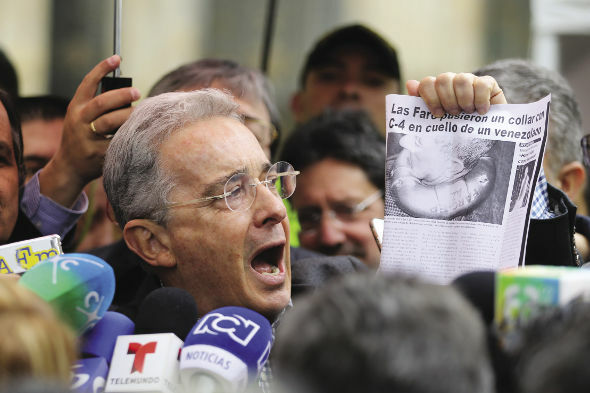 The day after the referendum, Uribe showed a 13-year-old picture of a man wearing explosives. At the time we thought FARC kidnapped the man. This was wrong. With the picture the country remembered a terrible action and it made peace more difficult to find. Uribe’s interest seems to be not peace, but his own political position. Talks with Uribe and others from the ‘No’ campaign and the government began a few days after the referendum. But organisations like the Process for Black Communities (PCN) and the People’s Congress, led by indigenous communities, said they were worried that new peace talks between Uribe and Santos would not include their needs. They called for national protests to ask the government to keep the agreements made. To wait is a risk. Before the referendum, the ELN, a guerrilla group of about1,500 combatants, agreed to have talks with the government, using the agreement with FARC as a model. There was news of peace talks at the time of writing this article. But the country is waiting and the situation is uncertain. International organizations, such as the UN, are waiting. The peace process may lose this international support and the way to make sure the people and FARC are safe. This is a difficult time. But it is possible that the bad political situation now will bring peace. Santos will do anything for his peace proposal. Uribe cannot disappoint six million people. They believed him when he said that by voting ‘no’ to the peace agreement they would get a ‘better’ new peace agreement. FARC leaders understand that waiting can make it difficult to keep the trust of their troops. And all the people of Colombia, ‘yes’ or ‘no’ or non-voters, want an end to fear and uncertainty. The peace agreement is important but it is only one first step to a fairer Colombia. The referendum did not ask Colombians for their ideas on what is wrong with the economic system or the serious environmental problems. It was only to end 50 years of conflict. But perhaps through talks to change the conflict there will be a chance of bigger changes for the country. The referendum is not the only problem we have had. In 1999, Guatemala had a referendum for changes to the constitution made during its peace talks to end 30 years of conflict. As in Colombia, most people said ‘no’, but it did not stop the peace process. For four years, across the country, and in different communities, Colombians have been making peace and democracy. One referendum cannot stop all of that. The peace process in Colombia has already started, with or without the vote. This page was last edited on 4 November 2016, at 11:17.